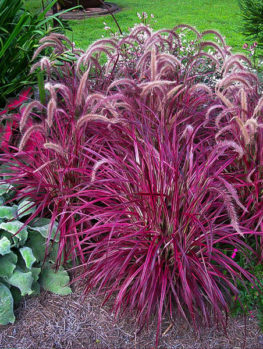 Probably the biggest change in garden over the last few years has been the growth of interest in ornamental grasses. Older gardens concentrated on flowering plants, and grass was just something to make a lawn with. As gardeners looked for innovative ideas to make interesting gardens, they discovered the world of grasses, and they have never looked back since. With their unique look, and because they are available in so many different forms, these plants really bring a ‘new look’ to gardens. Since they can be anything from a few inches tall to over 10 feet tall, with every size in between, they can be used in any size of garden. Despite their lack of showy flowers, they are colorful, with many shades of green, red, yellow, blue and variegated foliage. They can be narrow and upright, or spreading fountains of leaves. With so much variety, it is no wonder they are popular ways to add interest to every garden, and in every part of it too. 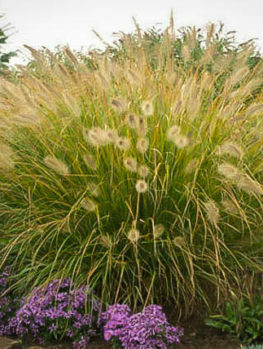 Few plants offer as many choices around the garden as ornamental grasses. With their great diversity of forms and colors, they fit in almost anywhere. They come in many sizes, so there are plants for the smallest garden, but also large specimens for big properties. 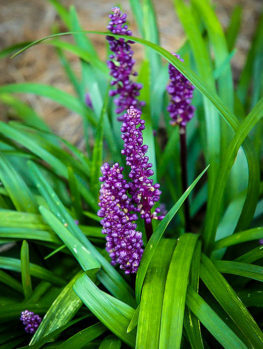 Although the majority grow best in sun, there are grasses and grass-like plants that thrive in shady spots, as well as some that enjoy damp or even wet soil. Some are very winter hardy, others do best in the warmest areas. No matter what you want to do, there will be a grass that will do it. Between their interesting foliage and their decorative sprays of seeds, there is a lot to see with grasses. They change with the seasons, often looking their best in late summer and fall, when many other plants in the garden are getting ‘tired’. Many of the larger grasses look wonderful standing alone in a lawn. 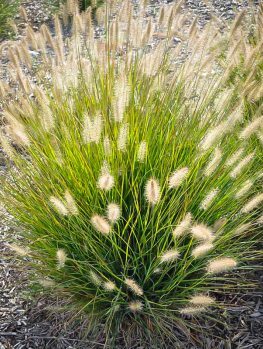 Pampas grass is a classic for this use, but many other large grasses – or medium-sized grasses in smaller gardens – can be grown in this way. Their grace and elegance will be shown to perfection, and they will thrive in these open, sunny locations. 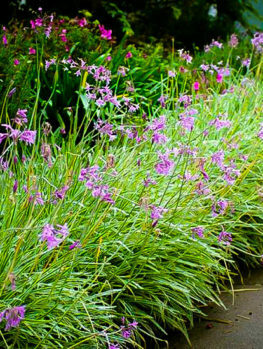 Smaller types of grasses are perfect to edge beds and borders, or to plant along driveways and paths. They will soften the hard edge of a path, without growing over it and spreading too much. Unlike edging with low hedges, such as boxwood shrubs, which need regular trimming, well-chosen grasses will stay low, and only need an annual trim. You can choose a suitable size to balance the size of the bed, and so keep everything in scale. 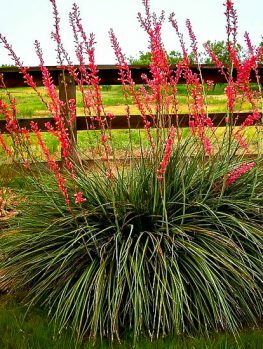 Popular plants for this include Elijah Blue Fescue for sunny areas, and the different forms of Lily Grass for sun or shade. Most people plant their beds with a variety of shrubs, and perhaps flowers too. 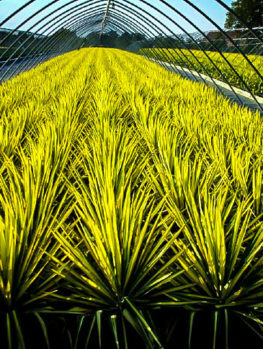 Adding grasses really lift the design quality of your beds, because these plants create such striking contrasts. Their narrow leaves are completely different from other plants, and their upright growth contrasts with the more spreading nature of most shrubs. Very effective low-maintenance gardens can be created with a suitable mix of evergreen and deciduous shrubs and conifers, with grasses added for variety and interest. Many of the smaller types of grasses are excellent mass-planted as ground cover. 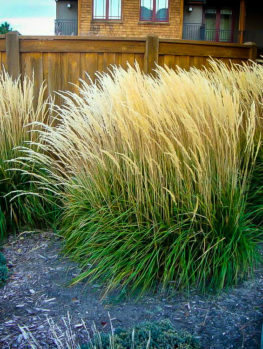 They are especially useful in sunny places, since grasses like Elijah Blue Fescue grow best in sunny areas. In contrast, most of the more widely-used groundcover plants, like periwinkle or wintercreeper, are best in partial or full shade. 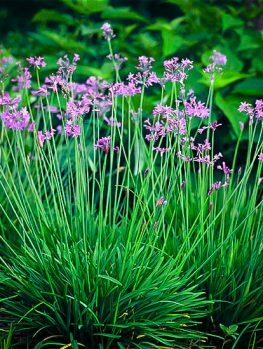 If you do want to use a grass as a groundcover in shade, choose something like Lily Grass, or a sedge, both of which grow well in shade and damper soils. Grasses also work well in planter boxes and pots. They can form the permanent part of a planting with annual flowers, and they give useful height to your arrangements. Most will last for several years, avoiding the need to re-plant every year, and with all the colors and forms available, they are often seen as being more interesting than annual flowers. Grasses are very variable, but almost all can be easily recognized as ‘grasses’. They have long, usually narrow leaves, with the veins running in parallel rows, rather than radiating from a central vein, as they do in the leaves of almost all other plants. 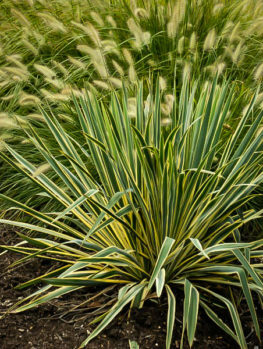 The leaves are usually green in wild grasses, but ornamental grasses have been selected and bred for gardens, so they have foliage in many distinct colors. Some grasses are yellow, some are red, some are silver-blue, and others are purple or bronzy. Even if they are green they can be very variable, ranging from lime-green to deep khaki-green, blue-green or every other shade possible. Grasses really are flowering plants, and they do have flowers. The difference is that they are pollinated by the wind, not by insects, so they don’t need the elaborate colored petals of most other flowers. Instead of typical flowers, grasses have flowers called spikelets, which have all the ‘working parts’, but nothing extra in the way of decoration to attract insects. Once the flowers are pollinated they change almost imperceptibly into seed heads, which often hang for a long time, and in many grasses are very decorative. When choosing grasses, a basic piece of information is to check if they are clump-forming or spreading. Clump-forming grasses, as the name suggests, form dense, compact clumps – growing larger, but staying where they are planted. Spreading grasses grow more like the grasses in a lawn, spreading outwards to cover larger and larger areas. These can be useful in larger gardens, for filling large spaces, but they should be planted with caution in smaller areas, as they can easily become invasive and take over parts of the garden. Grasses are easy to grow. Most thrive in full sun, in any well-drained soil. Some are best in damp soils, others in dry ones, so always match your choices to the conditions in our garden. You will have plenty of choices, no matter what soil conditions you have. 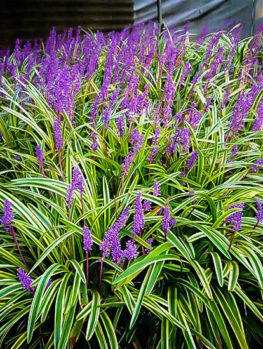 For shady areas, consider sedges or Lily Turf, neither of which are true grasses, but which look a lot like them. When planting your new ornamental grasses, make sure you allow them enough room. In their pot they may look small, but some grow large, and the foliage often arches outwards. They look best when given enough space to expand without getting trapped in other plants. 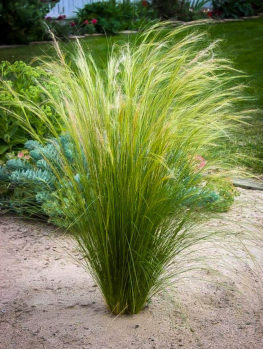 Dig the soil well, and if it is sandy, enrich it with some organic material, or choose grasses that do well in sandy spots, like the Elijah Blue Fescue. Plant them at the same depth that they were in the pot, and water young plants regularly until they become well established. If you want to grow spreading grasses – and many are very attractive – but you don’t have a lot of room, then plant them in a large plastic pot with the bottom removed. Dig a large hole, place the bottomless pot in it, with just a couple of inches of the rim above ground level, and fill it with the soil you removed. Then plant normally. The roots of the grass will be diverted by the walls of the pot, and they cannot spread out of bounds. If you use a large pot, such as one 24 to 36 inches across, then the grass will be happy inside it for years. Ordinary lawn edging will not work, as the roots will simply go underneath it. 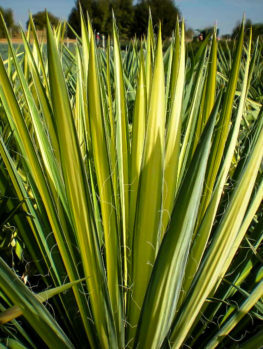 There are hundreds of different grasses used ornamentally in gardens. Whole books are written on them, but a handful stand out as the most popular and dependable. With so many different plants to choose from, the best way to learn more, and to find suitable plants for your particular situation, is to look briefly at some popular plants. Here is a summary of some top choices, followed by a brief description of them. 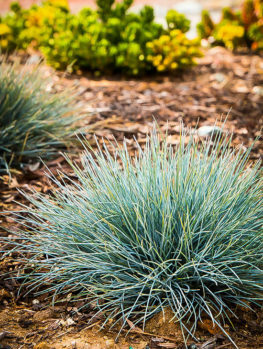 Blue Fescue – the adorable blue clumps of this miniature grass are striking, wherever you use them in your garden. 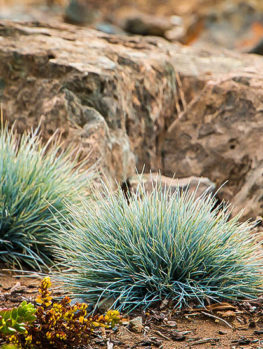 The best variety to grow is Elijah Blue Fescue (Festuca glauca ‘Elijah Blue’), as this vigorous form has the bluest foliage of all. 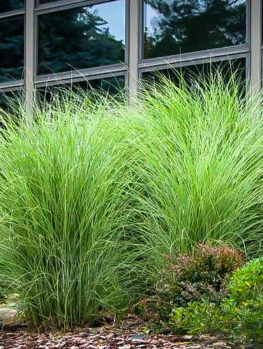 Blue Fescue is one of the very best grasses for smaller gardens, since it normally grows only 12 inches tall. 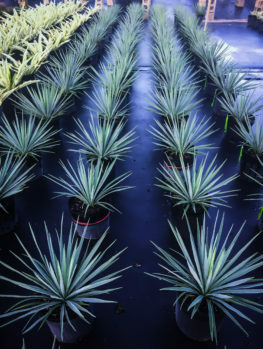 It grows best in drier, sunny places, although it will grow well in any well-drained soil. 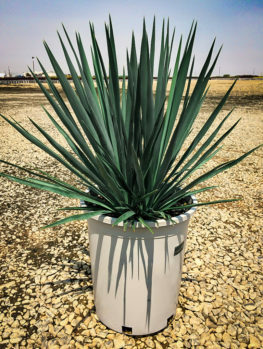 Plant in full sun for the best color and densest growth. Individual clumps can be planted in the front area of any bed. A row is the perfect edging. This plant grows well in containers, and since it is winter-hardy you won’t need to replace it each year, as you do with annual flowers. 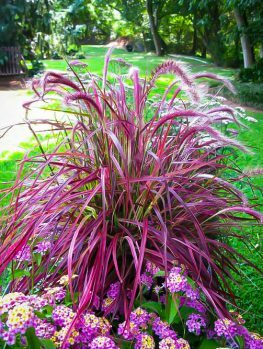 Fountain Grass – the different and varied varieties of fountain grasses, or Pennisetum, give many different possibilities. Most are 1 to 3 feet tall, with fine, upright leaves in dense clumps. These curve over, making the ‘fountain’ of their name. Many produce attractive seed heads with a cylindrical form, and best of all, many have colored leaves, that can be anything from rich green to deep red. Sadly, most are not very hardy, so in colder areas they are mainly grown as annuals. Japanese Forest Grass – looking like miniature bamboo, and growing just a foot or two tall, Japanese Forest grasses (Hakonechloa) are invaluable for shady spots, especially since most grasses like sun. They are slower growing, so never take over, yet they form beautiful carpets of foliage, with some types having glowing golden leaves, while others are bright cream, bringing light and interest to those darker shady places. Lily Turf – although not really a grass, this plant certainly looks like one, forming clumps of broad, upright leaves. 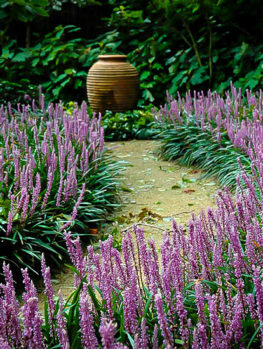 The most dependable and interesting varieties are Royal Purple Lily Turf (Liriope muscari ‘Royal Purple’) and Variegated Lily Turf (Liriope muscari ‘Variegata’). The first of these has foliage of a rich purple color, while the second has striking foliage of deep green, with a white band down either side and extra lines of white down the center. They are evergreen, so they look great all year round. In fall these plants show they are not really grasses, by producing spikes of rich-blue flowers. This unexpected display is striking against the typical fall leaf colors or red, orange and gold. 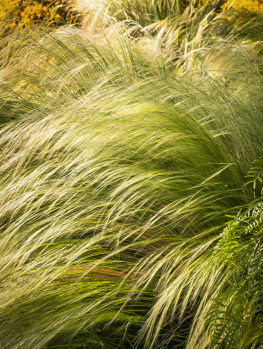 Maiden Grass – these grasses, called Miscanthus, include some of the largest ornamental grasses grown in gardens. 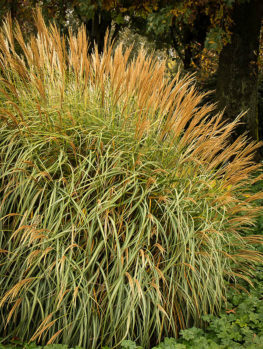 Chinese silver grass, Miscanthus sinensis, is a clump-forming variety that can grow 6 feet tall in a season. 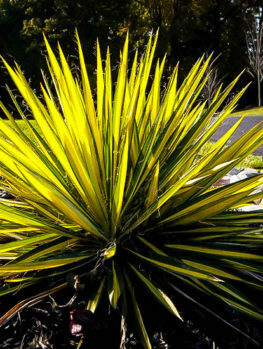 It has many garden varieties, often with golden striping, or in the unique variety ‘Strictus’, horizontal bars of gold across the leaves. 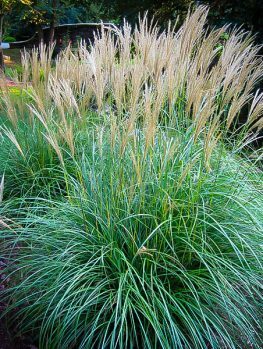 This is a clump-forming grass, but Silver Banner grass, Miscanthus sacchariflorus, is not. 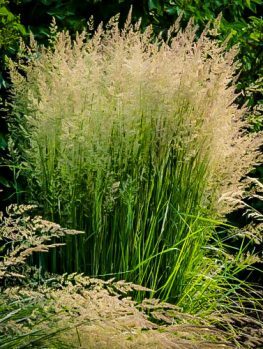 Although tall, bold and beautiful, varieties of this grass should be planted with caution, as they are spreading grasses, that can be very invasive, especially in damp soils. 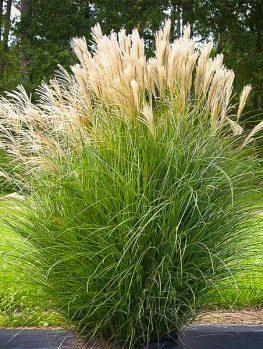 Pampas Grass – for a tall grass in warm areas, this is the top choice. 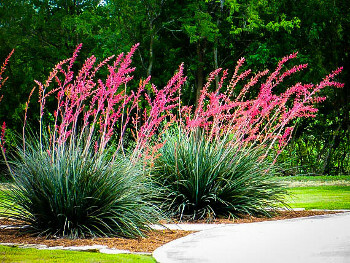 With a dense clump of long, thin leaves, and large plumes of flowers, it makes a striking lawn specimen for a larger garden. Growing very large, Cortaderia selloana, as it is called, can reach 10 feet or more, with flower plumes even taller. It is more-or-less evergreen in warm areas. Some garden forms are much smaller, but they are still often 4 feet tall or more. Sedges – Although not strictly-speaking grasses, these plants, which often grow in damp or wet areas, look a lot like them. An easy way to tell the difference is that sedges have stems with a triangular cross-section. 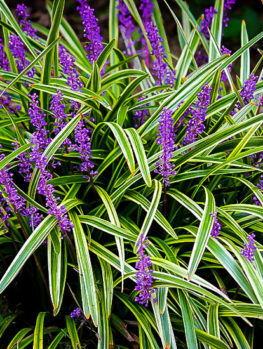 Most garden varieties belong to the group Carex, although others are sometimes grown. 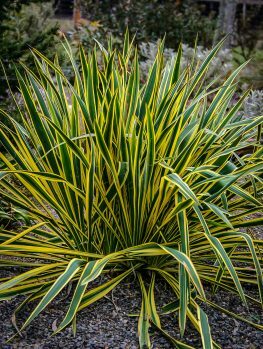 With their ability to grow in wet soils, and with many in partial shade too, these are very useful for those conditions, where most grasses will not grow well. 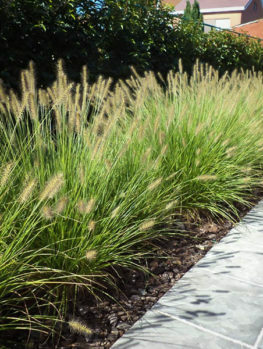 Switch Grass – although their name doesn’t sound very exciting, these grasses, have been bred in many different forms for gardens, and give us lots of choices for variety and interest. A dominant grass of the American prairies is called Panicum virgatum, and it is tough and hardy. 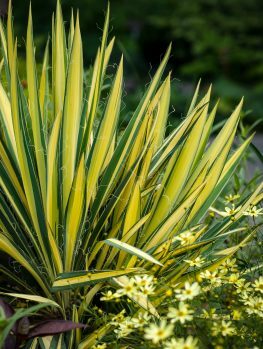 It has forms in different leaf colors, including reds, and unique bronzy shades, and most grow around 3 feet tall, making them good choices for medium-sized or smaller gardens. 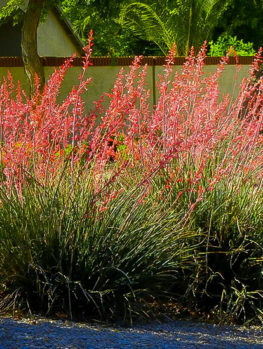 One of the best things about growing grasses in your garden is how little care they need. Most are attractive all winter, and many gardeners leave them untouched until late winter or early spring. At that time all that is needed is an annual ‘hair-cut’. Some are virtually evergreen, and don’t even need that – just leave them alone. Trimming can be done anytime from late fall to early spring, and in areas with a lot of snow your grasses may collapse under the weight, so fall trimming can be best for them. Trimming is easy, just cut all the foliage away, leaving a clump of stems at the base. 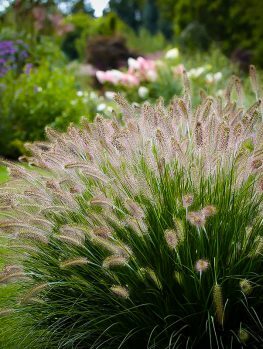 For smaller grasses this clump that you leave will just be a couple of inches tall, but for larger grasses it might be 12 inches high. The important thing is to do it before any new growth comes. If you cut the new leaves, they will look ‘chopped’ and unnatural, and trying to remove old grass from among new shoots is a difficult job. So get this simple garden task done early, before you see new growth. This means late winter for most grasses, although some, notably the different forms of Chinese silver grass, sprout late, so there is no rush to get them trimmed. If you have planted spreading grasses, then they can be controlled by cutting around the area with a sharp spade, removing spreading shoots as you go. An alternative is to plant inside a large, bottomless container, described earlier, which will stop them spreading. Watch they don’t sneak over the rim, or your efforts will have been wasted. Organic mulch spread around your plants will feed them, and keep the growth vigorous, or you can scatter a handful of lawn food around them too, in spring. This will encourage sturdy growth, although it is usually not necessary for mature plants.